Washing machines are miraculous contraptions. In go the dirty, smelly clothes (as well as some other surprising things) and out they come all clean and fresh with just the push of a few buttons. We have all come to rely on them to relieve the more labor-intensive task of washing clothes by hand. But as wonderful as a washer can be, there are still some things that should never be put in one. Some things are obvious: cell phones, wallets, ballpoint pens, keys, and coins left in pockets should never go in a washer. Then there are those small and delicate items like baby socks, lingerie, and lace pieces that can go in the washer, but should always be placed in a mesh bag to protect them from being lost or damaged. Perhaps less obvious are these eight things that will be ruined by just one or repeated trips through the washer. Even though swimwear is definitely designed to be in the water, the water in a washing machine is not the best choice. The mechanical action of the machine can be damaging to straps and the inner structure of women's swimsuits. Plus, washing the high-tech fabric of most swimwear along with clothes that have zippers and hooks can cause holes or snags. If you want your swimwear to last, handwashing is a much better option. Even if the outer fabric of a suit is cotton, polyester, or another machine-washable fabric, tailored jackets, slacks, and skirts should never be put in a washer. Sandwiched between the outside shell and the lining are materials called interfacings that give a jacket its crisp shape. When exposed to water, most interfacings become misshapen and some can even disintegrate. A suit jacket should be taken to a dry cleaner along with the matching pieces, so that the overall color will remain consistent. Fabric sneakers can benefit greatly by a trip through the washing machine. Leather sneakers, however, do not. Most leather athletic shoes have some parts that are put together with glue that can be damaged by both excessive moisture and heat. While the surface of leather clothes can be reconditioned after getting very wet, the washing machine is going to leave the surface marred and wrinkled. Opt instead for a professional cleaner who specializes in leather care. With these garments, always read the care label. Yes, there is washable wool and velveteen (a cotton/polyester blend fabric commonly found in children's clothes) can also be washed, but most wool and cashmere should be treated more delicately and hand-washed. Velvet, heavily-sequined or embellished garments, and all tailored wool garments should be taken to a dry cleaner. After seeing the price tag on most neckties, that should be enough warning not to toss them in a washer. Neckties are often made of silk and the inner structure can become twisted and misshapen in the washer. Handwashing or dry cleaning is always best. If you want to turn your solid foam pillows, mattress pads, and chair cushions into shredded foam, then toss them in a washer. Again, the machine's mechanical agitation, especially the spin cycle, is just too much for these items. A bathtub of lukewarm water, a gentle detergent, and a bit of hand-squeezing followed by a good rinse will keep them clean and smelling fresh. Even though pet blankets, beds, and clothes need regular cleaning, they should not be tossed in a washing machine if they are covered with hair. Just like your hair can clog a bathroom sink or shower drain, pet hair is terrible for the water pump filters and drains in your washer. Before you toss items heavily covered with pet hair in the washer, take them outside for a good brushing or even toss them in the dryer with a couple of dryer sheets and allow them to tumble on low heat or air only for fifteen minutes. This will remove enough of the hair so you can wash them safely. When a garment is heavily stained with motor oil, gasoline, cooking oil, paint thinner or alcohol, it's a good idea to presoak it first in a large laundry sink or plastic tub with some heavy-duty detergent before tossing it in the washer. Fabrics that are excessively stained with these flammable fluids can instantaneously combust and cause a house fire. If the fabrics are coated in these substances, you will also end up with residue left in your machine that can transfer to the next load of laundry. Most importantly, you should NEVER place these stain-soaked items in a clothes dryer, even after washing. The potential for an explosion is not worth the risk. One of the worst things you can add to your washing machine is an excessive amount of detergent or fabric softener. With today's concentrated products, overdosing will actually leave your clothes less clean than usual because the fabric holds onto the excess product, which traps body soil and odor. Using too much product can also result in mechanical problems for your machine. 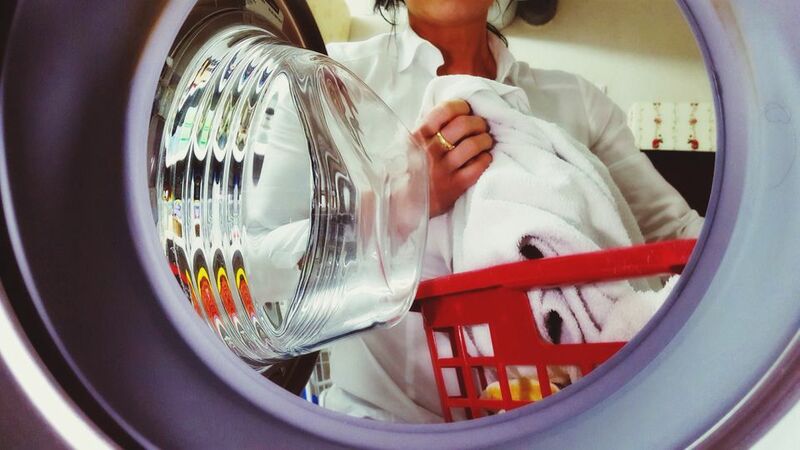 In high-efficiency washers that use a small amount of water, excess suds and residue from fabric softener can trap soil and bacteria and produce very foul odors.